Yesterday (16th August 2017) CRT seized a boat that was a vulnerable person’s home using its powers under Sections 8 and 13 of the British Waterways Acts 1983 and 1971. The boat was craned out at Devizes Wharf at 11am and taken to an unknown location by road. There were 8 bailiffs and enforcement staff present. UPDATE: It has been reported that the evicted person is now sleeping rough. Yesterday (16th May 2017) CRT seized a boat from Bishops Cannings and craned it out at the Black Horse in Devizes. The fibreglass cruiser, appeared to be unoccupied when six bailiffs started push-towing it with a dark green dory at around 10am to the Black Horse, where an A. B. Tuckey’s crane and flatbed truck were waiting. Film maker Wendy Zakiewicz invites all boaters to the launch of her new film ‘Off the Cut’ on Wednesday 23rd March 2016 at 7pm at St Margaret’s Hall, Bradford on Avon, BA15 1DE. Following the case of Geoff Mayers—where CRT removed his boat and transported it 200 miles to prevent him gaining access to it—by using Court procedures in an underhand way, it has become necessary to examine those procedures in some detail. 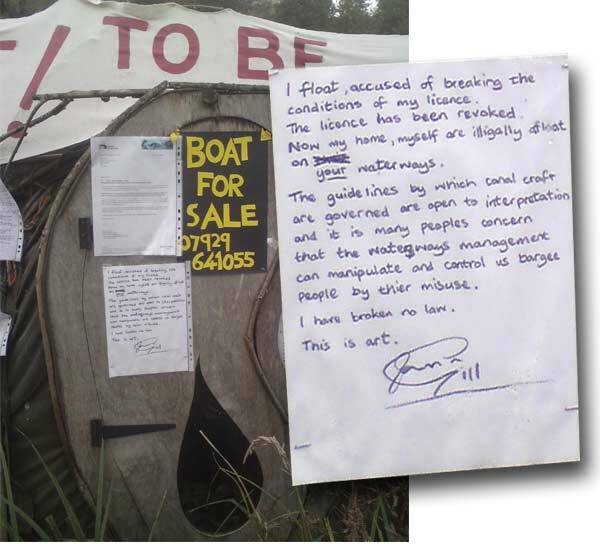 An interesting discussion has followed the news story about Ian Gill’s public protest at BW’s removal of his license and attempt to interprete the law. We are asking long and loud – and we will not desist until we get an answer – what is the problem with the boats that prompts these attempts at ethnic cleansing? “I float accused of breaking the conditions of my license. The license has been revoked. Now my home, myself are illegally afloat of your waterways. The guidelines by which canal craft are governed are open to interpretation and it is many people’s concern that the waterways managment can manipulate and control us bargees by their misuse. I have broken no law.